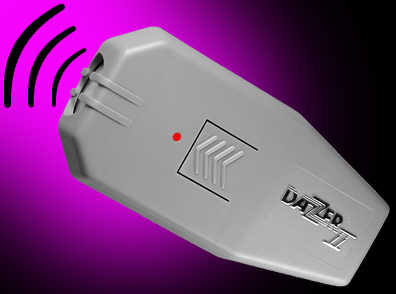 Using the latest ultrasonic technology, the DAZER II produces a discomforting but not harmful high powered sound, audible to dogs but not to humans. Help stop the approach of unwanted dogs at up to 20 feet. Also a useful aid in training dogs. Made of lightweight high impact plastic, the DAZER II features a belt clip and low battery indicator, includes an alkaline battery and is MADE IN USA. The DAZER II makes a great gift idea. Download DAZER II instructions, .pdf format.